As we begin 2011, the Florida Fish and Wildlife Conservation Commission's (FWC) Division of Freshwater Fisheries Management is renewing its commitment to conserve Florida's freshwater fish and aquatic life. 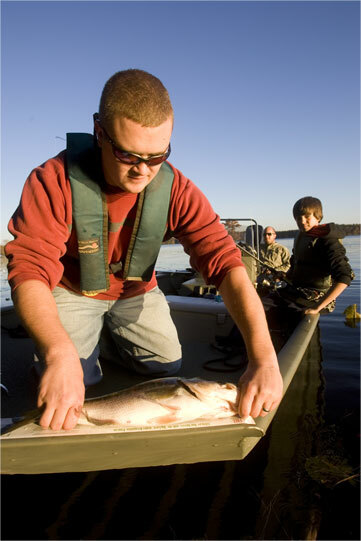 The 70 staff members specifically dedicated to this task include an array of technically trained scientists, passionate anglers, hands-on mechanical experts, and fish hatchery and administrative staff. Each one strives to achieve a level of excellence in his or her particular role, enabling us collectively to ensure Florida retains its position as the Fishing Capital of the World, based on great resources and responsible management. The FWC and the technical assistance group appreciate the 2,500 additional anglers who provided comments about the actual draft plan. All input is being reviewed. One area we learned needs to be addressed is management of bass fishing tournaments, which is the topic of the remainder of this column. Preliminary surveys showed conflicting public opinions about tournament fishing. Ray Scott, founder of the Bass Anglers Sportsman Society, brought a network of large competitive bass tournaments to reality and attracted millions of anglers to the sport, enhancing their understanding and enjoyment of what has become America's most-sought recreational fish. Along the way, tournament groups helped promote catch-and-release fishing and educated the public about conservation issues. However, many anglers feel tournaments exploit the resource and cause congestion at ramps. They are also concerned with bass mortality subsequent to release, and especially the impact of interfering with bedding bass. In drafting the Black Bass Management Plan, FWC staff considered the pros and cons of permitting bass tournaments to be temporarily exempt from size limits. On the Pro Side - Continue tournament permitting. Competitive bass tournament angling is very popular in Florida and has profound economic impacts locally and statewide. For example, the 2005 BassMaster Classic on the Kissimmee Chain-of-Lakes generated an estimated $25 million for the community during a three-day event. Some premier largemouth bass fisheries in Florida (e.g., Istokpoga, Orange, Walk-in-Water) have protective slot limits (15-24 inches) that would restrict tournament anglers from maximizing their daily weight. Because most tournaments, including small clubs, penalize anglers for dead fish, tournament anglers try to take very good care of their fish. Previous research in the 1980s and 1990s, including that of a short-term dedicated bass tournament review project, indicated they had no significant impact on the fisheries. Therefore, FWC began providing exemptions to size restrictions (but not bag limits) to allow tournament anglers to temporarily possess these fish, when a five-bass, statewide bag limit was established with only one bass longer than 22 inches total length. Permitted tournament anglers must release all fish after weigh-in and any dead fish must be donated to charity or research. Anglers in permitted tournaments cannot keep any bass, including their legal bag limit. Tournament angling depends on temporary exemptions to be competitive. So, for economic and social reasons, exemptions should be continued, since they don't hurt the resource, compared with allowing these same anglers to harvest their catch. This angler on Lake Talquin carefully measures a bass to ensure compliance with the rules. Many anglers think it is unjust for tournament participants to get even a temporary exemption from designated size limits. Harvest restrictions are set to manage a fishery based on a stated objective. Research from the University of Florida and elsewhere has shown that tournament-associated mortality could negatively impact a fishery if tournament pressure becomes too high. Tournament-associated mortality has been found to average 26 percent to 28 percent, and modeling effects of this mortality shows that, under certain circumstances, it could affect the sizes of fish available for anglers. Thus, all anglers should follow size restrictions to ensure objectives are met. Given both sides have valid points and science is not totally clear on the impact of tournaments, the FWC has some important decisions to make. Clearly, our No. 1 objective is to ensure sustainable bass populations. Tournaments won't affect that, but they could alter the quality of a local fishery. Moreover, this is a resource-allocation issue, so sharing of public resources in an equitable manner and economic and social considerations need to be weighed. FWC has a team endeavoring to think outside the box and consider testing alternative solutions, at least for smaller qualifying tournaments, such as paper or digital tournaments. The previously mentioned technical assistance group and others will help us to refine the most appropriate options to test. As an example, with smart-phone technology, pictures of fish can be taken on official rulers, date-stamped and the location plotted with GPS accuracy, enabling the angler to immediately release the catch. Recommendations have not been finalized, and you can still contribute by completing a brief survey about tournament bass fishing at //www.surveymonkey.com/s/BBMP_tournaments. We wish you all a wonderful 2011 and look forward to hearing your input on these Fish Busters' Bulletins as we endeavor to keep you informed about what's happening in Florida's freshwater fisheries.